Albert Maguire, MD, is an Attending Physician in the Division of Pediatric Ophthalmology at Children's Hospital of Philadelphia. Albert Maguire, MD, is a Clinical Associate of the Division of Pediatric Ophthalmology at Children's Hospital of Philadelphia. He is an Associate Professor of Ophthalmology at the University of Pennsylvania and director of the retina service of the Division of Ophthalmology. Dr. Maguire received his medical degree from Harvard Medical School in 1986. He completed an internship in surgery at Yale-New Haven Hospital then went on to the Wilmer Ophthalmological Institute at Johns Hopkins Hospital where he did a residency in ophthalmology. Dr. Maguire did his combined medical/surgical retinal fellowship at the William Beaumont Hospital in Royal Oaks, Michigan. He received extensive training in diagnosis and treatment of pediatric retinal diseases at one of the world's busiest pediatric retina consultative practices. 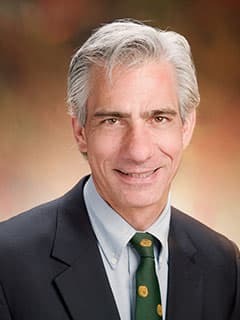 Dr. Maguire returned to Johns Hopkins as the associate chief of service before coming to University of Pennsylvania and Children's Hospital in 1992. He received his board certification from the American Academy of Ophthalmology in 1992 and is a member of numerous professional and scientific organizations. Dr. Maguire's areas of clinical expertise are in the diagnosis of pediatric vitreoretinal diseases and their medical and surgical management. He has acted as the retina consultant for the Division of Ophthalmology at the Children's Hospital of Philadelphia both in the inpatient and outpatient setting. He participates in clinical research in retinopathy of prematurity performed at Children's Hospital. His research interests also involve laboratory investigations developing treatments for incurable retinal degenerative disease including Leber's Congenital Amaurosis — a retinal disease causing blindness in newborn infants. He is an investigator in several studies sponsored by the National Institutes of Health and private organizations. Harvard Medical School, Cambridge, Mass. Wilmer Eye Institute, Johns Hopkins University Hospital, Baltimore, Md. Aleman TS, Brodie F, Garvin C, Gewaily DY, Ficicioglu CH, Mills MD, Forbes BJ, Maguire AM, Davidson SL. Retinal structure in cobalamin C disease: mechanistic and therapeutic implications. Ophthalmic Genet. 2015;36(4):339-48.